Draws a circle based on a center point and a diameter or a radius. Defines the radius of the circle. Enter a value, or specify a point. Defines the diameter of the circle. Enter a value, or specify a second point. Draws a circle based on three points on the circumference. Creates a circle tangent to three objects. 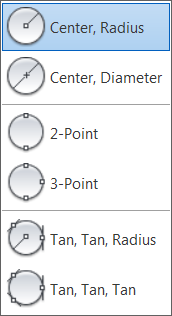 Draws a circle based on two endpoints of the diameter. Draws a circle with a specified radius tangent to two objects. Sometimes more than one circle matches the specified criteria. The program draws the circle of the specified radius whose tangent points are closest to the selected points.